Let me tell you how important it is to have a good ladder on your sailboat. This picture of my bruised arm was taken after the bruising had started to fade and I don't bruise easily. It had been a great day of sailing with 4 friends (Kevin, Mike, Darrell & Denny) on my Sirius 21 but the wind had dropped off so we threw out the anchor and poured some Sailor Jerry. 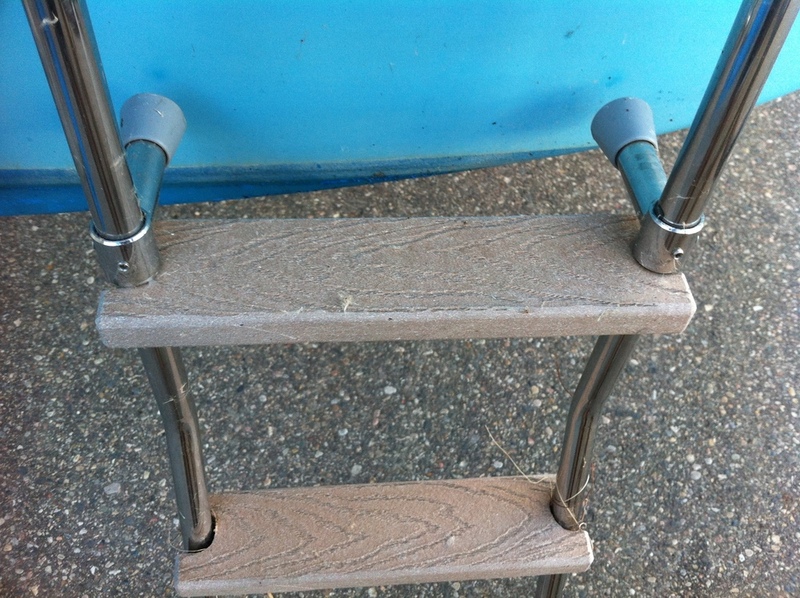 I had a cheap gunwale ladder hung over the back railing. With that many people in the cockpit Sailor Jerry ended up giving someone a shove and their arse knocked the ladder in to the lake. Thinking quickly, in hindsight maybe not that quickly, I dove in after it to grab it before it sank. Well, sink it did along with my way of getting back into my boat. No worries I'll just climb up the outboard. Not a chance! Flip up the rudder and hoist myself up. Ha! My friends tried in vain to haul me in but all I got were bruises. Mike almost puked on me he was laughing so hard. Finally Darrell thought of tying loops into a line and with that I was able to get back on board. I vowed to install a permanent ladder by the next spring. I spent the winter scouring many suppliers online to find my perfect ladder and I made my purchase. On the day I was about to install it my dock neighbor Bill said that they had the same ladder on their Hughes 22 but the tubing rungs were very hard on the feet. I picked up an off cut piece of some composite decking at the lumber yard for $10.00 and set out to modify my ladder. I cut the decking into strips that I thought would work then cut the length to match the outside to out side of the vertical tubing. I measured center to center of the tubing. To do this I measure from left side to left side or right to right. I drilled holes in the decking step then I just cut out the notches, squeezed them into place. I attached the composite to the tubing steps with PVC conduit clamps. I didn't have to put any holes in my new ladder. The end result is very easy on the feet. And very easy to get back into the boat at any time.